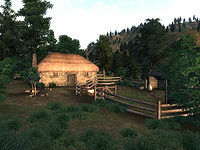 Shardrock is a sheep farm between Skingrad and Kvatch (quest-related). The interior of the farmhouse is quite messy as Thorley spends the majority of his waking hours outside, maintaining his garden and sheep. A table in the southwestern corner holds a wide array of food, half of it spilled onto the floor below, including six carrots, five leeks, four heads of lettuce three tomatoes and two cheese wedges. Two single beds are available, both of them free to sleep in. 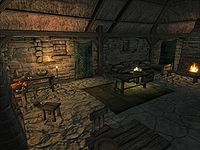 The chest and drawers near the beds contains clutter, with a spare set of Blacksmith's Pants and a bottle of Surilie Brothers Wine lying around. In the northeastern corner is a cupboard with food and drink, along with five sacks and two barrels with clutter. The sacks are all safe for storage, but all other containers respawn. The farmhouse is locked most of the time; Thorley only opens the doors between 6am and 9am in the morning, and between 6pm and midnight in the evening. Esta página foi modificada pela última vez à(s) 03h40min de 15 de outubro de 2012.